It may be rush hour but Superman isn't helping. Glassy eyed he digs up an ancient jar and flies off leaving Metropolitans stuck in a traffic jam. The Super Friends arrive and help rebuild the road until Superman returns with a blank in his memory over what he did and why. Diana uses her magic lasso to unlock the memory and he remembers Felix Faust. Faust had gained control of Superman with a magical finger puppet, his idea is to use the Friends to retrieve three magical items to help him dominate the world. A jar, a bell and a wheel... and now he has the jar! Superman volunteers himself for arrest in case the finger puppet is used again to control him. In jail Superman is now very depressed, worried nobody thinks he's a hero anymore. Batman points out of the window for his friend to see the crowd outside and Clark's heart is restored. Meanwhile Arthur and John are hunting for the Wheel while Flash and Diana search for the Bell. Without warning Diana suddenly is entranced and then Flash and they race to help Faust. Aquaman and John also suddenly lose control and head to Faust to give him the Wheel. A young boy who had seen Superman steal the Jar earlier is asking all his�neighbors�to sign a card of support for his favorite hero and sees Faust with the magic finger puppets. Meanwhile as John and Arthur are heading to�Faust's�hideout they see an emergency... their strength of character allows them to save a sinking ship but they still can't fight the compulsion of Felix�Faust's�magic. When Batman hears this over his comm link he hatches a plan. The young boy sees Batman and Superman enter his building and presents him with the card. He tells them everyone signed it except his�neighbor, nasty Mr. Faust. To further show his support he also vows to wear his Superman costume to show his belief in his hero. Hearing that comment, Batman hatches a plan and convinces Superman to help at super speed. Is it too late? The Super Friends present the magical items to Faust and though they try to fight the magic they cannot fight its power.�Faust�is almost able to control the universe... all he has to do is open the Jar, but that can only happen if he makes the puppets on his fingers vanish. He�realizes�if he removes the finger puppets he'll lose his power over them so he orders Superman to tie up his friends till he can complete the spell. Only it doesn't work and Faust finds he's drained his magic! The�Super Friends�remove rubber masks and reveal they had been inspired by the young boy to swap costumes so the magic wouldn't work on the right people and they were right! The young boy is�surprised�to hear that Green Lantern has hidden the magic Bell and Wheel in opposite planets across the universe with the Jar stays hidden on the Super Friend satellite. Superman takes Snapper, the little boy, on a ride home and thanks him for giving them their belief back! XOLI ISDO, GO CKMO INO FOPIOY'P ZOKQEO BC KDOYSMK! 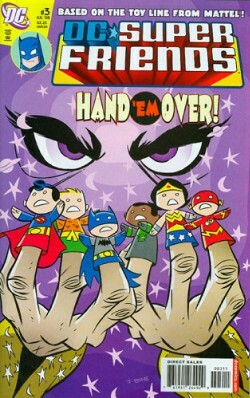 Wonder Woman Fact File, Wonder Words jumble game, Finger Puppet Show. Story - 3: A unique twist on the 70's gimmick of rubber mask swapping! Faust recreated as a miserable old man with illusions of grandeur made it hilarious for an adult reader and very enjoyable for younger readers. Snapper was a nice character, perhaps he'll stick around? Art - 3: I'm not over the giganto limbs yet, but the artwork is inspired and approachable to everyone. The special features also introduce a lot of fun! Cover Art - 3: Another play on a 70's theme cover but injecting the fun into it with bright coloring and some great little puppets - I want the trinity now lol. J Bone is a brilliant cover artist!